While bearings remain some of the most rugged and resilient components, they can still fall prey to the problems of wear. Unremedied, worn bearings can result in much larger problems; their failure almost inevitably brings mechanical systems to a halt until they can be repaired. To avoid this expensive downtime, it is essential to learn the various sources of wear in rolling element bearings. One of these factors is the operating speed of the bearings’ mechanical system. High speed applications play a common role in roller bearings applications; ensuring proper maintenance will help protect against the excessive wear that can lead to system failure. With high speed operations, bearings can reach very high temperatures by churning in oil or grease. Lubricant is required to mitigate the natural friction that occurs between two bearings operating at high speeds; however, higher levels of bearing action can result in decreased viscosity in lubricants. This loss of viscosity is defined as churning, and continued bearing action during churning causes agitation that can ultimately cause the lubricant to fail and the bearings to overheat. When working at higher speeds, bearings naturally gather greater inertial forces. If lubrication is not adequate, or bearings exhibit sudden stopping and starting, the forces between the retainer and the rolling bearings can become even greater. If not dealt with, these inertial forces can ultimately cause retainers and bearing cages to break, causing overall system breakdowns. Another difficulty that can arise from a lack of lubricant and higher speeds is slippage between the raceways and rolling elements. This most often occurs when the lubricant coating is absent from bearing contact areas. When this contact is made at high speeds and without lubricant, wear can occur at a rapid rate. Tightly loaded bearings have the greatest risk of slippage under these circumstances. While the above demonstrates the various difficulties that can arise from high speed operations, the solutions are fairly simple. 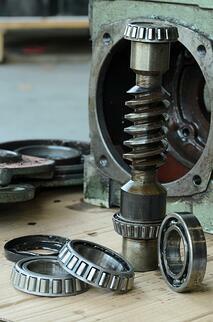 You can maximize bearing longevity by ensuring proper lubrication and making load adjustments when required. The proper care of bearings will ensure their place as one of the most reliable components in nearly any system. The issues of churning, breakage, and slippage can all be addressed with proper lubrication. It is essential to get the correct balance when lubricating bearing systems. Too much lubricant runs the risk of churning, while too little does not adequately separate bearing parts. Proper lubrication will reduce bearing wear in the highest speed settings, protecting against costly and potentially dangerous breakdowns. It is also important to keep in mind that lubrication has a limited service life as well. When subject to mechanical stress and aging, lubrication loses a certain amount of viscosity and lubricity, leading to conditions like churning. Relubrication can be beneficial when this is the case, keeping wear to a minimum during the most difficult industrial conditions. When systems have adequate lubrication, wear from high speed operation can still occur if the bearings have not been properly matched with the load requirements of the application. This can be solved by either changing the system’s overall load, which is not always an option, or employing proper bearings. 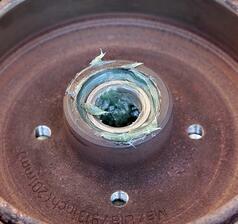 For example, in the case of slippage, damage can occur when the load on the bearings is too light. An increased load under these circumstances will lessen the chance of a slip occurring. In lieu of a load increase, this problem can also be lessened by installing smaller bearings. These adjustments are enormously helpful in solving the issues that occur from high-speed applications. Emerson Bearing has more than 50 years of experience in bringing customers the most appropriate roller and ball bearings to fulfill their exact specifications. Quality products from Emerson provide the industry’s best reliability and longevity — with proper maintenance, they can outlast the equipment in which they are installed. To learn more about how to prevent failure due to high speeds and other issues, download our Emerson Bearing Failure Analysis Guide today.